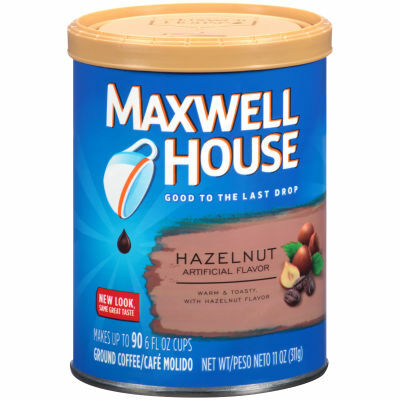 Maxwell House Hazelnut Ground Coffee - A perfectly balanced coffee flavored with the slightly sweet, buttery taste of toasted hazelnuts. Our Maxwell House Hazelnut ground coffee contains natural and artificial flavors to give you the exquisite taste of a barista-made hazelnut coffee in the comfort of your home. - Warm and Toasty Hazelnut Flavor - At home, adding flavored syrup into regular coffee is not the only way to get a sweet, nutty brew. Our Hazelnut Ground Coffee gives you a smooth, creamy and mellow hazelnut coffee without the need for additions, anywhere, any time. Your friends and family will love it.